This article is part of our monthly “Startup of the Month” series. You can read more articles from that series here. The most talked about acquisition this year has been the nabbing of Whatsapp by Facebook, and because of that, a lot of other deals have been overshadowed. One of those overshadowed acquisitions, was BBVA’s acquisition of a banking startup called “Simple“, for over $116 million. That’s certainly an impressive sum, but what really impressed me about Simple, was how true to their name they were. 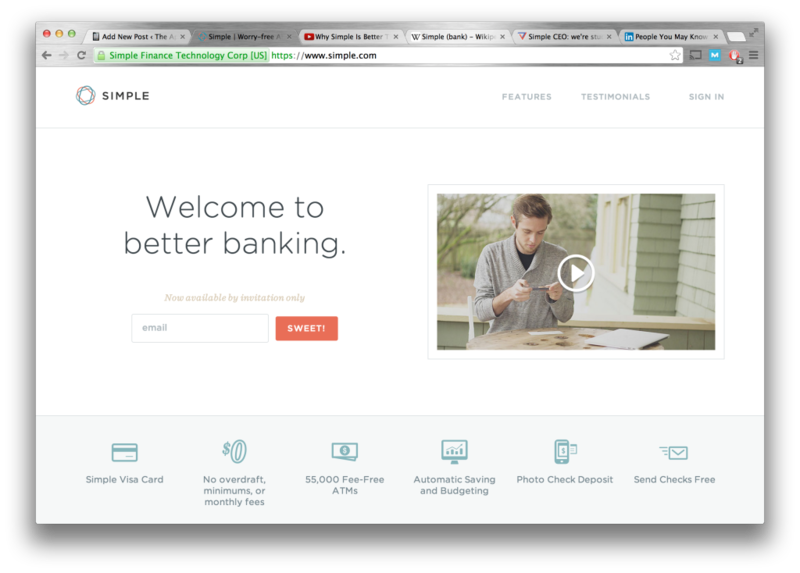 Simple’s work in creating a friendlier, more high-tech financial institution (and their success at that) is what made them March’s startup of the month. Why is Simple a startup of the month? First of all, they are one of the most successful banking startups in recent memory. Banking is so filled with regulation that it’s nearly impossible to start a successful bank independently. Simple did just that, and they did it so well, that within five years, they sold their company for over $100 million. A few immigrants in Brooklyn with a crazy idea, turned that idea into a highly successful reality. Secondly, they’re setting a trend for more technologically advanced, and customer-friendly banks. Their no-fee model, and their focus on user experience is new to banking, and if it catches on, will be extremely positive for just about everyone that uses a bank. Also, unlike other financial upstarts like Bitcoin, Simple is a natural extension of traditional society, rather than something entirely new. It’s an improved iteration of a bank – a far better system, but not something too difficult to grasp. It truly is “simple”, but excellent. Keep tabs on the latest startups and technology. Question of the Month: What industry do you hate, and how could technology improve it? My answer: The Department of Motor Vehicles – Put almost all of it online. Your answer: Leave a comment, and share your thoughts.